But what happens when gutters are shrunk, or non-existent? What about the panel itself? What happens to the way we read a page in the absence of those boxes? Scott McCloud would tell us, and I would agree with him, that removing panels gives images a “timeless” quality. By doing this exclusively, Nilsen changes the descriptor to “endless.” Nilsen gives the images room to breathe by using the white of the page as a negative space amorphous meta-gutter. Everything seems to hover in a fog; without a discernible goal, nothing is concrete. 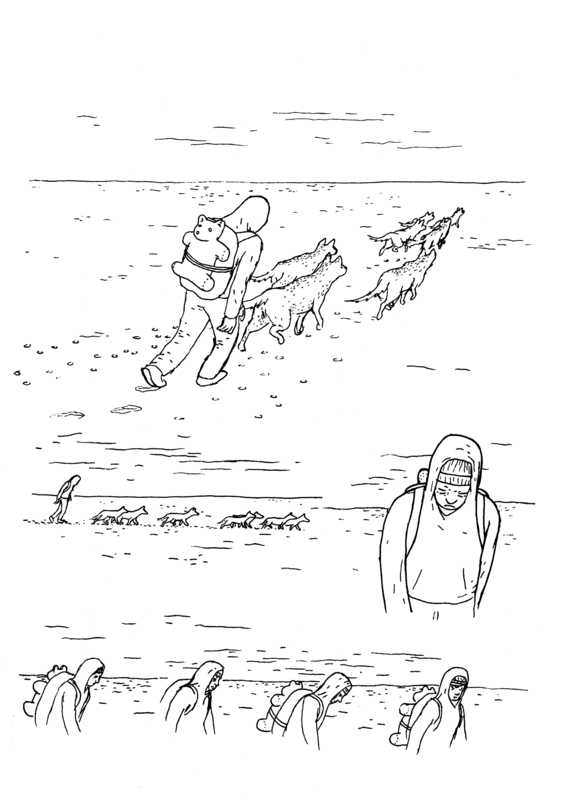 This approach is in perfect harmony with Nilsen’s trackless, symbolic crisis of a story. This exception proves the rule, however. In the absense of philosophical musings and existential dread hiding in the guise of a largely plotless story, the panelless approach would slow a story to an interminable drudge. Panels pick up the pace, allow for quick movements, and utilize the space of the page with the most economy. Between the lack of emphasis and the constant requirement of the reader to separate the images herself, a lack of the structure of boxes is exhausting. Most stories do not have “exhausting the dear reader” as one of their stated aims. How’s this for more conventional? It’s got Wolverine in it! This is yet another iteration of the constantly deployed samurai showdown: concurrent charge, blades out, slash, pause — one falls. You know and love it from every episode of the wonderful Samurai Jack and every issue of Shonen Jump ever. Aron Wiesenfeld was one of Image Comics only great finds, but for whatever reason he never found himself drawing Bendis comics for Marvel or Flash covers for DC, and this lack of recognition in commercial art apparently forced him to take a giant step backward into the world of fine art. His gallery catalog bios make no mention of Deathblow and Wolverine, nor Team 7! This is truly a shame, because look at the fine work this gent was doing. I love how the “camera” seems to rotate around the jumping combatants while they are mid-air to capture their profiles from panel one to two. Wiesenfeld accomplishes this by keeping Wolvie’s body at the exact same height across the tier. The beautiful use of negative space in the second panel, specifically at the right as we reach the end of the tier, freezes the action beautifully with figures only tethered to one side of the frame. The image becomes one of those impossibly balanced dynamic old sculptures. 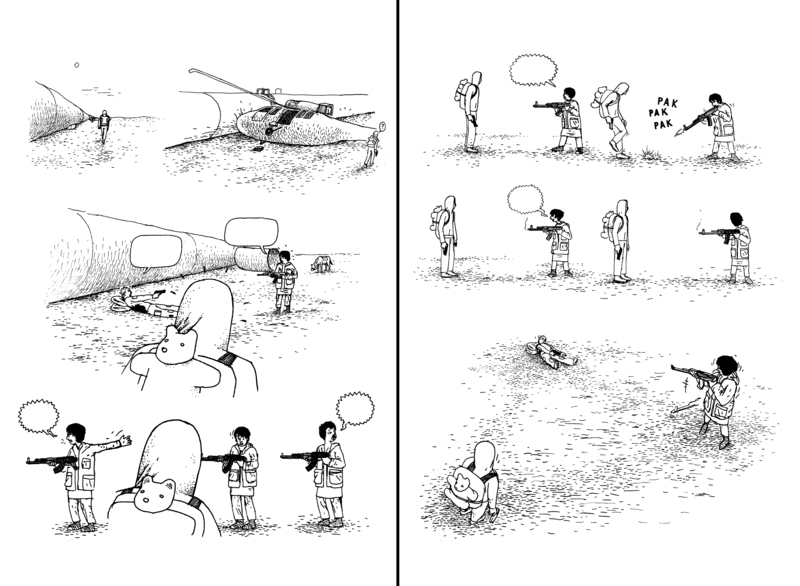 But then Wiesenfeld brings the whole thing to a deliberate pause when they land by (everyone now) REMOVING THE PANEL! Notice again how the two opponents hover on the page timelessly. The anticipation of the result is killing the reader rather than either of them. After this deliberate halt, we eventually climb to the next frame to the brilliantly deployed “Oww,” from poor old Logan, who then falls in the panel below as paneled speed resumes. The bottom half of the page does something sort of baffling: panels become hand-drawn rather than ruled, and gutters disappear. Now, most commentators would tell you the thinner the gutter, the quicker the action between the two panels, in a progression of building speed until gutters vanish altogether and then actions are nearly concurrent. I guess I agree with the beginning of that statement to some extent, but my feeling is that when gutters disappear, reading almost always just becomes difficult — therefore slowing down the pace. That our brains can somehow create movement from juxtaposed drawings is nothing short of remarkable. Read some books by Russian filmmakers like Sergei Eisenstein to get truly bowled over by how odd it is that our brains are programmed to synthesize disparate images and create connections even when there are none inherent. Wiesenfeld makes this all less confusing by perfectly placing his negative space in each abutting panel, but I’m still not sure the effect was in line with his intent. 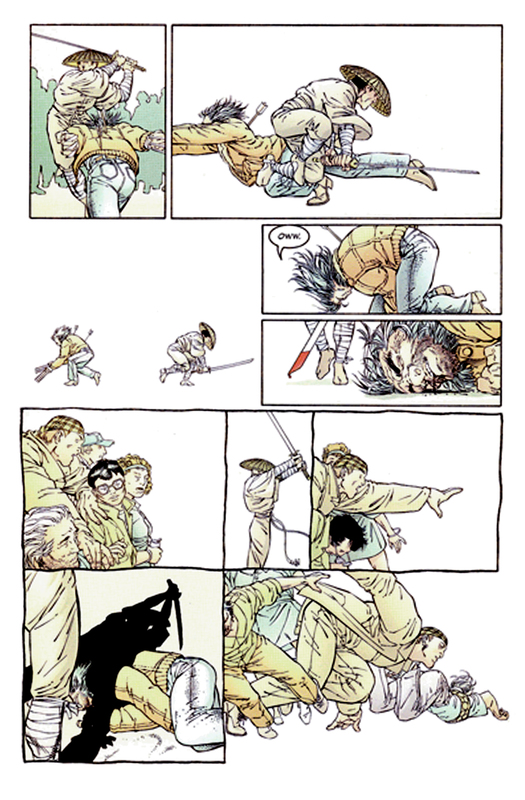 The gutters seem to disappear because everything is happening so fast, but because of the problem outlined above and the every-single-bit-of-movement-like-this-was-drawn-by-an-animator – ness of Deathblow’s fall, I find the bottom of the page instead reads like slow-motion camerawork. The wobbliness of the panel borders is perhaps to show what a shaky situation Wolvie is in, or perhaps some sort of stereotypical Asian linework to indicate that the ninja is in control here. That the final panel is again borderless, but also nearly shares the space with the non-consecutive panel above it, gives Deathblows tumble the feel of escape. He is free of that packed in crowd and those packed in, gutterless panels. By ending with a timeless fall, it seems that Wolverine is doomed. A frozen fall strands Deathblow in no position for a rescue. The clumsiness of it all is emphasized for all to see without a box to give it structure. So borderless panels give emphasis and pause the action on a page full of panels. But for the sake of seeing this discussion through to its logical end, let us ascertain the effect of a bordered panel on a page that lacks them. As I indicated above, Dogs and Water is a profoundly important book to me. The experiments I created below should not be viewed as any sort of attempt by me to improve Nilsen’s work. I am merely creating before and after pictures, or perhaps more appropriately, developing a scientific experiment with a control, so we can observe the different effect of each rather than merely speculate on what should happen to the read. I would argue that the modified latter image is more shocking. The border creates a pause, a hurdle for our eyes to surmount before we reach the awfulness. And once there, the panel traps us inside with the horror. Used to freedom to roam the page, our eyes now do not know how to escape the confines of the panel at a time when they are especially desirous of doing so. The contrast is probably most responsible for the effect. But if we deliberately examine what seems to be happening to time, I believe it is not as simple as breaking the routine, whether from paneled to suddenly panelless or vice versa, creates a feeling of pause. Even when discussing something as relative as time, we can be more specific than that. When paneled pages deploy a panelless image, as occurs in the Wolverine page above, time that was moving quickly and linearly suddenly becomes more elusive. The relentless action, action, action concrete movements seem to dissipate — less freezing the action than pulling the camera way back for a pause, a breath that reminds one of the larger world one occupies. The pause is timeless because it is forever. The freedom of the absent border allows the reader to choose when to take up the narrative of concrete movements again. The action was taking place in specific units and places and then was suddenly taking place everywhere and always. The specific has become universal. But when panelless narratives employ a panel, as I forced Anders Nilsen’s to do, something very different is occuring. The universal, elusive meanderings have become specific. The protagonist was just going through the banal motions of his day, drifting from event to event, and is suddenly made to freeze on the concrete. This is the alcoholics “moment of clarity” and as such, is horrifying. It is a slap that forces one to definitively relate to that with which one is confronted. Unlike the previous paneled to panelless example, here the pause is to examine every detail of the scene one is trapped within; the former paused the action without that specific consideration of one’s situation. The former was a breather. This is a examination. The former was the pause of the third-person omniscient observer. This is the subjective pause of the protagonist. Both change and profoundly change the speed of the natural reading pace that had been established, but to much different ends. 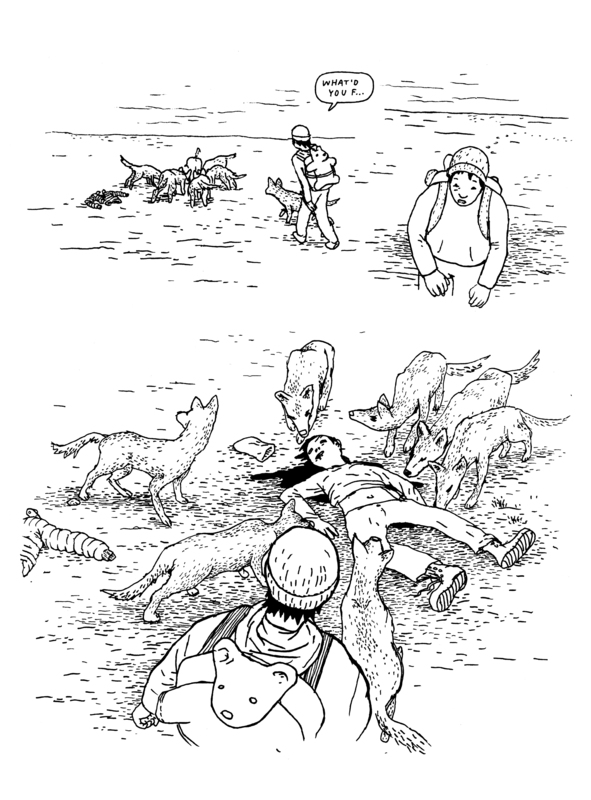 That said, look again at Nilsen’s original version of the page. 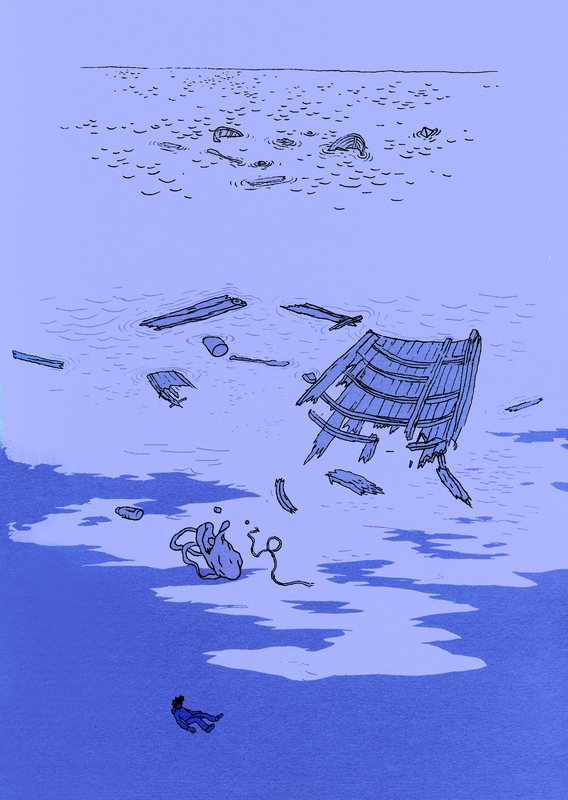 A murdered body is discovered by the protagonist, but the panelless approach continues. This is a run-of-the-mill event for the boy. For all its repulsiveness, it is just another situation he finds himself in on his journey. It receives no more weight than his wanderings. As an illustration of the completeness of the protagonists detachment from his world, the aimlessness of this journey he wanders through out of no discernible obligation or goal, it is even more terrifying as is.